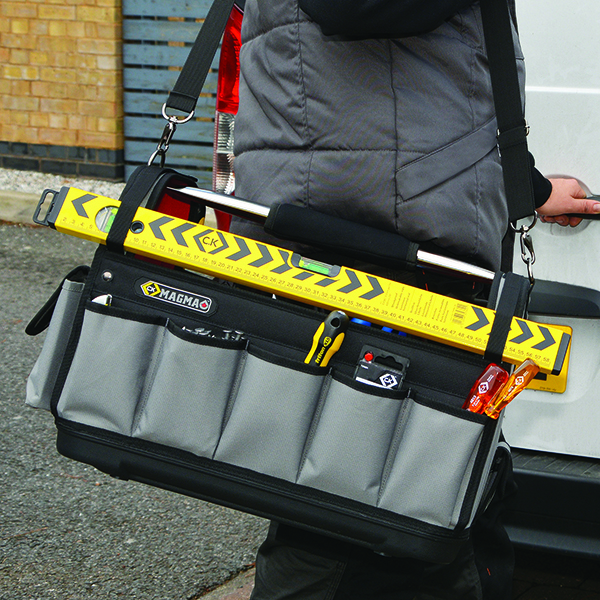 Following extensive research among tradesmen, C.K Magma has introduced the C.K Magma 18” Open Tool Tote, further enhancing its range of premium storage. The C.K Magma 18” Open Tool Tote is finely tuned to suit the needs of trade professionals and is a high quality, robust and practical storage solution with an affordable price tag, lending a helping hand to those tradesmen purchasing multiple storage systems. The tote features 12 vertical storage pockets, offering instant, easy access to equipment. There is also a large internal storage area with 33 additional pockets and holders, letting tradesmen keep all tools neatly organised to increase efficiency while at work. For those carrying the tote on-site from their vehicle, a padded shoulder strap provides maximum comfort, while a heavy-duty steel handle bar ensures the tote can be comfortably carried even when housing particularly heavy tools and equipment. 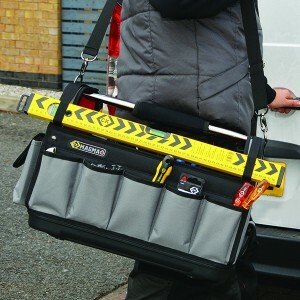 The tote also features adjustable straps specifically designed to hold a large aluminium level securely when on the move. In line with the existing C.K Magma range, the tote is built to withstand the rigors of building sites and industrial environments. The tote features a durable 600 denier polyester construction, rigid frame and 100 per cent waterproof and crackproof polymer base to protect against wear and tear, particularly when working outdoors in adverse weather conditions.